Step onto the Queen Emma Bridge and you feel a moment of vertigo as it shifts slightly beneath your feet. You’ll sway a bit and it takes a moment to realize that what appears to be a simple, conventional bridge with fixed points on either end is actually floating upon pontoons, sixteen to be exact. 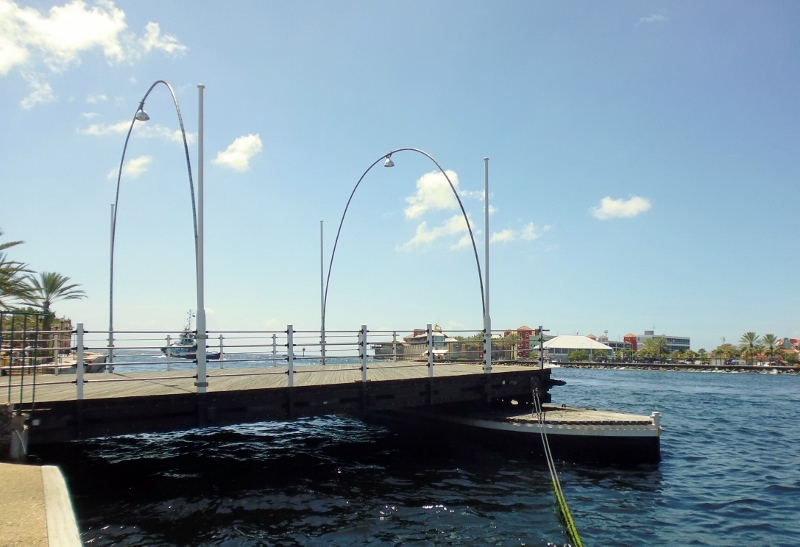 Nicknamed the “Swinging Old Lady” this permanent floating bridge spans the Sint Anna Bay and connects the two sections of Willemstad: Otra Banda and Punta districts. 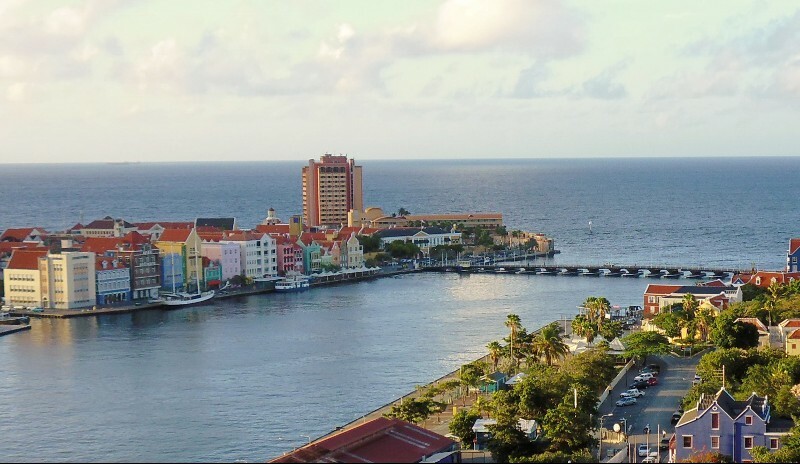 The city of Willemstad dates back to 1634 and the shoreline of the older section of the city, Punta, had structures crammed cheek to jowl by the time a bridge between the two parts of the city was contemplated. To have constructed a conventional bridge would have required the expropriation and destruction of a significant portion of the old colonial city. Entrepreneur and US Consul Leonard B. Smith came up with an elegantly simple solution that allowed the existing buildings to remain by designing a hinged bridge that swings out laterally from the Otra Banda side. The original bridge, completed in 1888, opens several times a day to allow passage of watercraft of varying sizes (up to and including the modern mega-sized cruise ships) from sea to the port and vice versa. When a ship wants to enter or exit the natural harbor, known as Schottegat, a flag either orange (for a short duration) or blue (for a longer duration) is hoisted alerting people. A bell sounds shortly thereafter and an operator sitting in a small cabin operates the controls for two diesel engines that allow the bridge to swing on its Otra Banda axis in an arc parallel to the shore, a process that takes a surprisingly short amount of time. During the time the bridge is open two ferries (ponchis) shuttle back and forth between Punta and Otra Banda transporting passengers for free. Named after Queen Emma of the Netherlands, the bridge was originally a toll bridge; two guilders were charged for pedestrians wearing shoes, ten guilders for horses and, in the 20th century, 25 guilders for cars. Since the poor citizens without shoes were allowed to cross for free many people would remove their shoes and walk across barefoot to avoid the toll. Others considered free transit a form of charity and would save both their shoes and their money for the special occasion of crossing the bridge, proudly paying the fee. After 1934 the toll was abolished and the issue of shoes became moot. Over the years the bridge was renovated and enlarged but increased shipping traffic through Sint Anna Bay to the Schottegat harbor resulted in longer and longer waits for cars wishing to cross. Construction began on the second bridge to be named after a Netherland’s queen, Queen Juliana Bridge, which is now the highest bridge in the Caribbean. Built to provide passage for the enormous ships entering the harbor, at its apex its height is 56.4 meters (185 feet) above the sea water which also makes it one of the highest bridges in the world. After the opening of the Queen Julianna Bridge on Oueen’s Day in 1974 which replaced the original structure, vehicular traffic on the Queen Emma Bridge ceased. 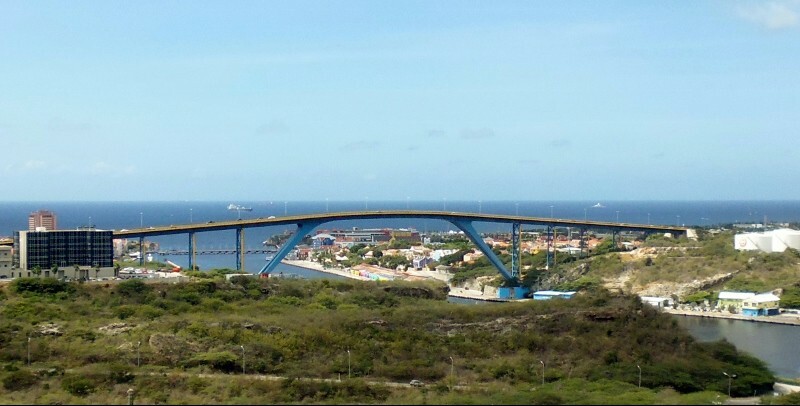 The view of both bridges from the commanding summit of Fort Nassau emphasizes the dramatic difference in the relative heights of these two complementary structures and underscores the important role these bridges have played in unifying the city of Willemstad. For the very practical Netherlanders the bridges they’ve built reflect radically different personalities. 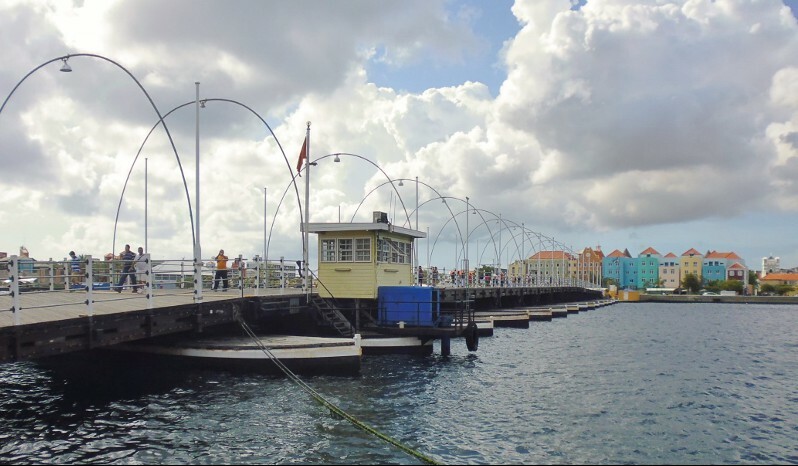 The old lady, Queen Emma, undulates slowly while pedestrians cross from one side of Willemstad to another then swing dances open to allow the passage of the harbor traffic. And the regal Queen Juliana from her lofty height is the soaring beauty of the urban island skyline. Ingenious! And the history of the shoeless people who could walk across the bridge without having to pay. Did you research the history of the bridges, or did you find this information from talking to the locals? Where is your next stop? Our research was a combination of talking to the many people we met during our stay, our visits to the museums, leafing through the beautiful books that have been written about the island and online reading. We love checking out the history and legends during our stays in various places (can you tell?!) and think it makes us better travelers. As for our next destination, we’ve moved on to the Dominican Republic to visit friends for a few weeks and then … we’re off to Europe! Queen Emma Bridge looks like a great place to enjoy a walk. When I was in Barcelona i visited Port Vell where there is a swing bridge and I happened to be there when it opened to let some boats pass through – very interesting to watch it in action. We loved crossing the Queen Emma several times and were lucky enough to also have a chance to walk across the Queen Juliana Bridge. It closes only once a year for a few hours for the February “Walk For The Roses,” a fundraiser for cancer research. Seeing Willemstad from the lofty heights of the bridge gave us an entirely different perspective of this beautiful city. BTW, we head for Barcelona at the end of April and will be visiting the Port Vell swing bridge now that you’ve recommended it! Thanks! Two great bridges with different personalities. Beautiful photos of Curacao! Its colorful buildings have always looked so appealing to me but I haven’t yet visited in person. Curacao would be at the top of our list for any Caribbean destination we’d recommend and has been one of our favorite places to live in our two-and-a-half years of travel. There are so many places to explore and hike and of course, there are always the fabulous beaches! What a colorful place and a fascinating bridge and system, sounds like the ideal working bridge and perfect for taking a lot of amazing photos. This looks absolutely gorgeous and is one of the places in the Carribean we haven’t visited yet. Definitely on the list! Why are you guys leaving? The colourful buildings and architecture completely floored me too, and I had no idea that you could find such a rainbow paint palette in this part of the world. I’ve never visited, but of course it’s just one more place for my bucket list. Enjoy ticking places off yours, won’t you! It really is unexpected to run into this amazing architecture in this part of the world and, of course, this is what make Curacao so unique as well as what draws travelers from all over the world. If we hadn’t landed here by chance we would have added it to our “must see” list after we’d read about it! I never would have imagined that a post on bridges could be so interesting! Like you said, who would have thought bridges could be so fun to walk across and learn about? It’s so interesting to encounter these everyday working pieces of our world and view them from an outsider’s perspective. That’s what makes travel so amazing! I’ve not yet been to Curacao, but your photos certainly make me want to go! Love the multi-coloured buildings, and harbours are such a fascinating place. Thx for sharing! Wow Queen Emma is certainly a different bridge. Would love to walk on it. Has a certain flair, so down there, like almost with the water and so casual, like almost a roofless welcome canopy for the color that awaits you! Loved your description of the Queen Emma Bridge. 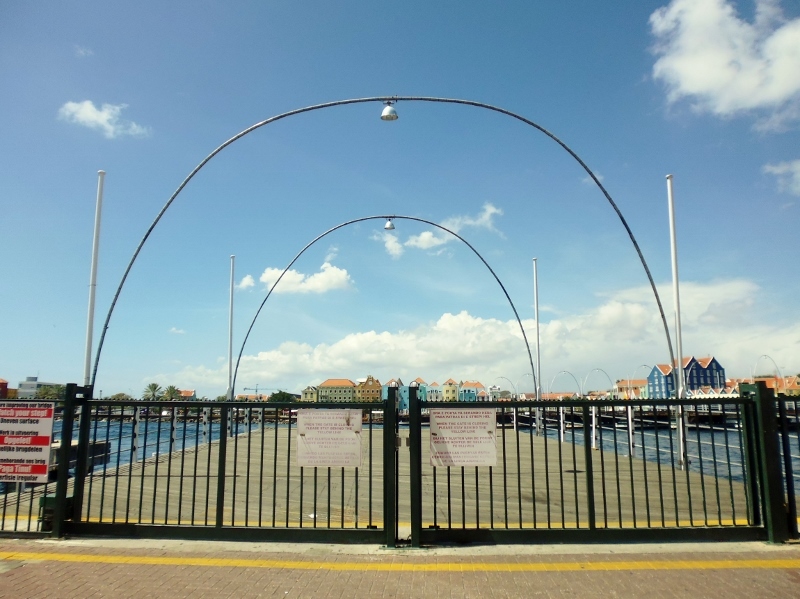 It’s a landmark of Willemstad that we enjoyed seeing swing into action as well as walking across it many times. The citizens of this area are justly proud of both their Queens! What an unusual place. I had not idea what country it was in and the colourful buildings had me thinking somewhere in Scandinavia so I was completely at the wrong end of the world. Those bridges are crazily different and I would like to visit and see this place for myself. How fun to have a mystery to solve while you were figuring out where the bridge was. The architecture of Curacao is an intriguing mix of Dutch design adapted to fit the tropical weather of the island and the Caribbean colors add an even more picturesque touch to the storybook effect! I think people either love bridges or hate them! I tend to like them and this one looks like a beauty! For many people it is a love-hate affair (maybe a combination of fear of heights and water?) but we love gawking at bridges, many of which are a stunning combination of form and function. In this setting, the Queen Emma represents function and the majestic Queen Juliana is form. 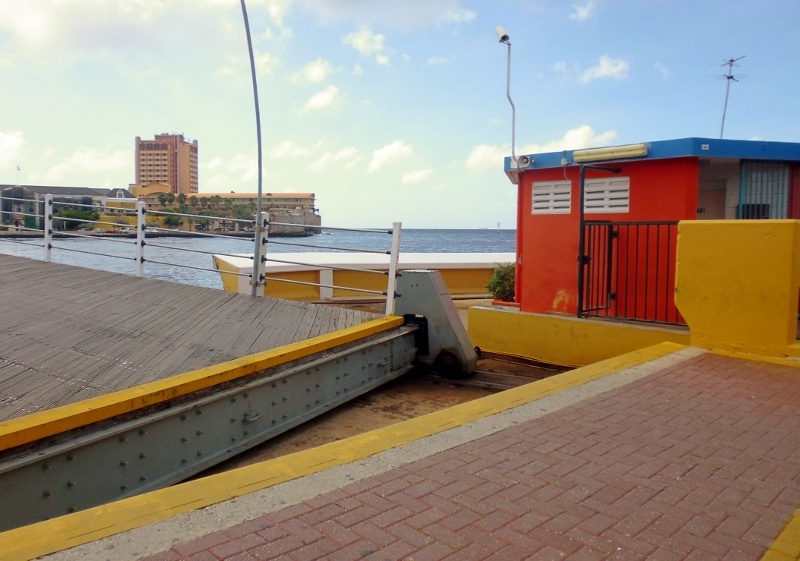 I remember fondly the Queen Emma Bridge in Curacao. Thanks for taking me back. 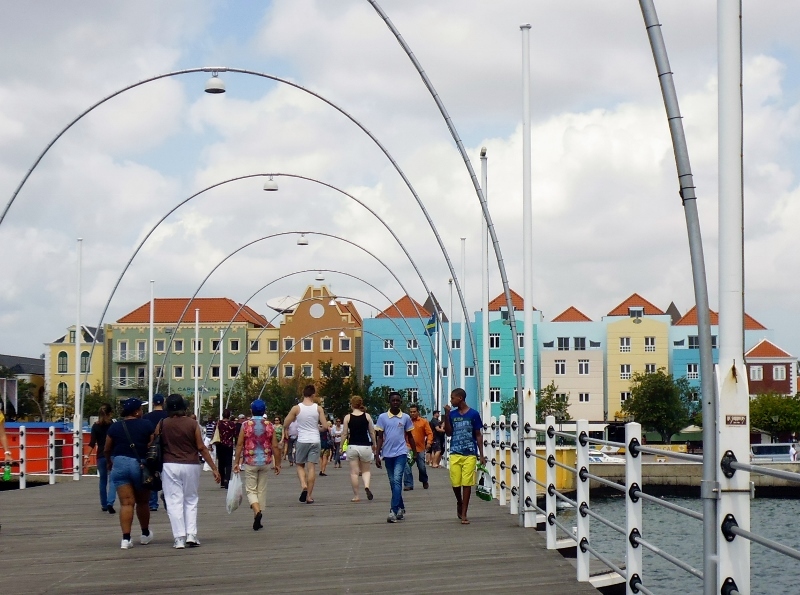 So glad our post was able to remind you of this unique bridge in Willemstad. 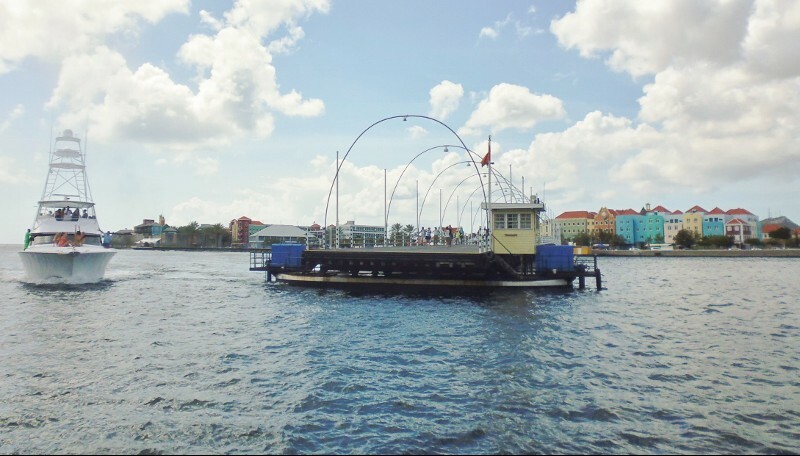 The Queen Emma Bridge really is a memorable and fascinating old beauty! Love this! Necessity is the mother of ingenuity and invention! In the places we’ve visited where the bridge is closed for water traffic, it’s often been a good reminder to just stop and have a look around instead of rushing to get somewhere. Walking across barefoot in order to save the toll sounds like something some of my more parsimonious relatives would have done! We had a great time watching the bridge open and close several times for water traffic and took the ferry across to view the bay crossing from that perspective as well. Good, free entertainment and it’s fun to take the time to learn about something unique and have the leisure to enjoy watching it in action. 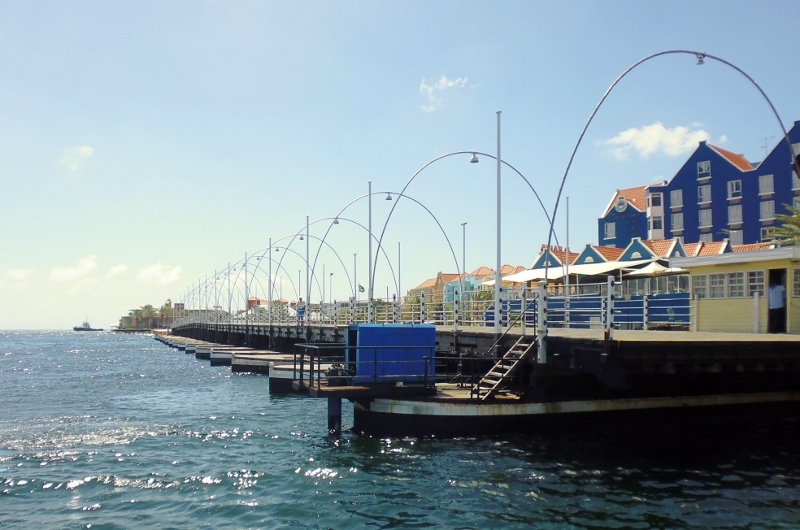 As you know I LOVE Curacao – I thought the Queen Emma Bridge was fascinating! The colors of picturesque architecture and the imposing Fort almost didn’t look real. I half expected the Disney Parade to come around the corner. Loved your post! Curacao is an easy country to fall in love with, isn’t it Suzanne? The colors and design of the buildings are amazing and, now that you mention it, do look like something that could be taken from a fairy tale storybook or a film like Mary Poppins. We loved it! I find this stuff fascinating. How long are you staying in Curacao? I am wanting to add the Caribbean to our list of places to stay a few months. We were lucky enough to stay on the west end of Curacao for 7 weeks and had a chance to explore many areas and hidden sides of the island. The history, hills, architecture and landscape are fascinating and I’d highly recommend a stay in one of the many rental homes available. Great post. Your detail explains it so well. Lots of research I’m sure. Have fun!!!! Seeing, walking and learning about the Queen Emma Bridge was fun and it’s always interesting to research something to figure out how it works. The tricky part is how to explain what we’ve learned! Reminds me of Panama and the huge ships that pass through. This place is so colorful that is more than charming from a Northeast winter. We bet it helps to remember that there are sunny and warm places during a northeast winter and this is a lovely place to be. You might want to put this on your winter go to list!